64 votes in and a 6.8. Got the kiss of death from hubby when he saw it at 7 something and said, "That's a typo". 6.92 at 105 votes. The more I look at it, the more my editing stands out like a sore thumb now. I'm excited and embarrassed at the same time. << removed ugly catchlights and darkened some lines. 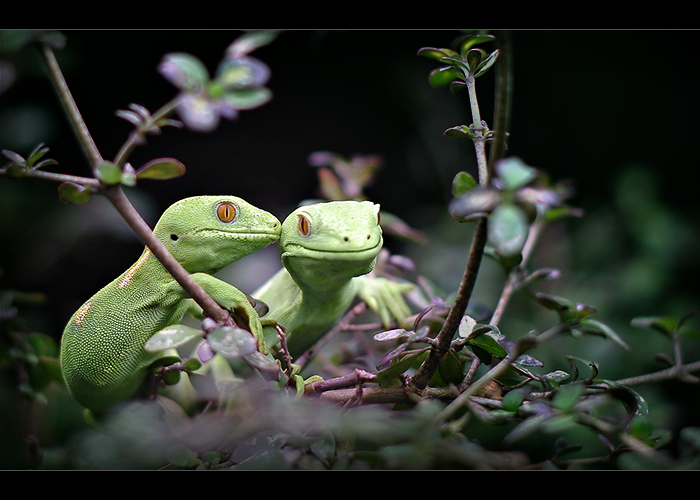 Anyway, before I forget, these geckos live at the Auckland Museum. It was feeding time while I was shooting, and the handler had released a number of flies into the enclosure. I stood there completely still for hours (yeah, well it felt like it), waiting for one of those flies to be collected by the geckos. What a photo that would have made, eh? NatGeo here I come! But no. All I got was some kissy action instead. Onoes! Can't find my original file!!!!! 5th place in a free study is kinda silly for a pair of lovesick lizards, but thank you for the votes, comments and faves! I guess it's ok to throw in a straight shot every now and then uh? Amazing photo. I can't believe this didn't place. I thought I had commented on this one, I gave a 10 for it....I love it! Congrats!! Oh its NOT silly for a 5th place of lizards!! This is beautiful Rina! Congrats on 5th in a FS! Congrats on your top five finish, beautiful pic! Excellant Rina. Congratulations on the 5th placing. WTG Rina!!! Gorgeous shot, congrats on your well deserved top 5 place. Whoa, well done! Man, I gotta go the Museum more! Congratulations Rina on your 5th Place. Great score too. Rina the more I look at this the more I like it. It's a cracking shot. It looks like he's whispering something in the others ear. I expect to see this in one of the top spots. Cute! The poses are great and the foliage nicely complements the lizards. Could maybe have used a smidge more DOF to get the 2nd lizard in sharper focus (sharpest detail appears to be on the side of the 1st lizard) but overall, nice job. I just remembered, I have to pay my Geico Bill...LOL... Anyway, lovely capture with good DoF too! Nice color, composition and framing. Should do well! Proudly hosted by Sargasso Networks. Current Server Time: 04/24/2019 12:04:49 PM EDT.